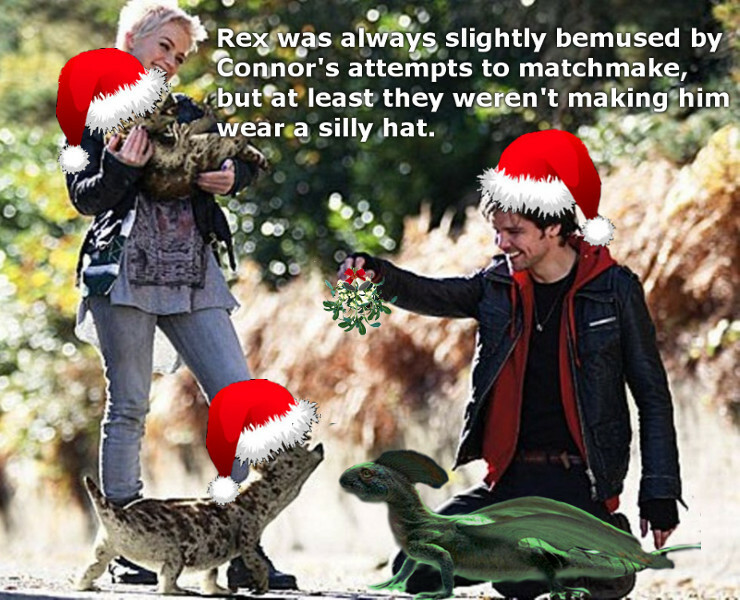 Denial Advent Graphic, Day 9, featuring Abby, Connor and their prehistoric pets. LOL! That's lovely and festive! Thanks! Rex and Abby somehow escaped the silly hats! LOL, so funny and so lovely! Thanks! They're so cute with their little family of pets, I couldn't resist. Thanks! Rex accidentally stole the show! LOL, lovely festive moment. Love Rex's thoughts. Thanks! Rex gatecrashed - he wasn't in the original idea, and then insisted he wasn't going to be left out! That is brilliant! Wonderfully done- very realistic :D Love Rex and the diictadons are hilarious with the hats! Thanks! The poor diictodons can't see a thing with the hats over their eyes like that, bless them! And I've just noticed your new header. Connor isn't looking impressed at all his competition! Thanks! I think Rex would refuse to wear a hat on principle! Hee! That' adorable. Rex needs to get into the Christmas Spirit! Thanks! I think Rex would be very unimpressed if anyone tried to make him wear a hat! Awwww! That is the most adorable thing! I imagine Rex's inner commentary would sound something like that. *g* Also, I am not surprised Abby managed to wriggle out of wearing a Santa hat! Thanks! I think Rex is permanently bemused by his humans, particularly Connor. I suspect Abby has Opinions about wearing santa hats! I decided it was time for a header change a couple of weeks ago, and it had been Primeval (and specifically Connor) for so long, so now it was time for something that reflected all the fandoms I was into, and all my favourite pretty boys. And there had to be River, because she's quite possibly the sexiest and most awesome woman on the planet.